This article is about the Latin term. For the star system, see Epsilon Capricorni. 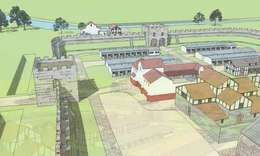 Templeborough Roman Fort in South Yorkshire visualised 3D flythrough, produced for Rotherham Museums and Archives. In the Roman Republic and the Roman Empire, the Latin word castrum (plural castra) was a building, or plot of land, used as a fortified military camp. Castrum was the term used for different sizes of camps including a large legionary fortress, smaller auxiliary forts, temporary encampments, and "marching" forts. The diminutive form castellum was used for fortlets, typically occupied by a detachment of a cohort or a century. In English, the terms Roman fortress, Roman fort, and Roman camp are commonly used for castrum. However, scholastic convention tends toward the use of the words camp, marching camp, and fortress as a translation of castrum. For a list of known castra see List of castra. Castrum appears in Oscan and Umbrian, two other Italic languages, suggests an origin at least as old as Proto-Italic language. Julius Pokorny  traces a probable derivation from *k̂es-, schneiden (“cut”) in *k̂es-tro-m, Schneidewerkzeug (“cutting tool”). If this is the civilian interpretation, the military version must be “military reservation,” a piece of land cut off from the common land around it and modified for military use. All castra must be defended by works, often no more than a stockade, for which the soldiers carried stakes, and a ditch. The castra could be prepared under attack within a hollow square or behind a battle line. Considering that the earliest military shelters were tents made of hide or cloth, and all but the most permanent bases housed the men in tents placed in quadrangles and separated by numbered streets, one castrum may well have acquired the connotation of tent. In Latin the term castrum is much more frequently used as a proper name for geographical locations: e.g., Castrum Album, Castrum Inui, Castrum Novum, Castrum Truentinum, Castrum Vergium. The plural was also used as a place name, as Castra Cornelia, and from this comes the Welsh place name prefix caer- and English suffixes -caster and -chester; e.g., Winchester, Lancaster. Castrorum Filius, "son of the camps," was one of the names used by the emperor Caligula and then also by other emperors. Castro, also derived from Castrum, is a common Spanish family name as well as toponym in Italy, the Balkans and Spain and other Hispanophone countries, either by itself or in various compounds such as the World Heritage Site of Gjirokastër (earlier Argurokastro). The terms stratopedon (army camp) and phrourion (fortification) were used by Greek language authors to translate castrum and castellum, respectively. Basic ideal plan of a Roman castrum. (1) Principia; (2) Via Praetoria; (3) Via Principalis; (4) Porta Principalis Dextra; (5) Porta Praetoria (main gate); (6) Porta Principalis Sinistra; (7) Porta Decumana (back gate). A castrum was designed to house and protect the soldiers, their equipment and supplies when they were not fighting or marching. This most detailed description that survives about Roman military camps is De Munitionibus Castrorum, a manuscript of 11 pages that dates most probably from the late 1st to early 2nd century AD. Regulations required a major unit in the field to retire to a properly constructed camp every day. "… as soon as they have marched into an enemy's land, they do not begin to fight until they have walled their camp about; nor is the fence they raise rashly made, or uneven; nor do they all abide ill it, nor do those that are in it take their places at random; but if it happens that the ground is uneven, it is first levelled: their camp is also four-square by measure, and carpenters are ready, in great numbers, with their tools, to erect their buildings for them." To this end a marching column ported the equipment needed to build and stock the camp in a baggage train of wagons and on the backs of the soldiers. Camps were the responsibility of engineering units to which specialists of many types belonged, officered by architecti, "chief engineers", who requisitioned manual labor from the soldiers at large as required. They could throw up a camp under enemy attack in as little as a few hours. Judging from the names, they probably used a repertory of camp plans, selecting the one appropriate to the length of time a legion would spend in it: tertia castra, quarta castra, etc. (a camp of three days, four days, etc.). More permanent camps were castra stativa (standing camps). The least permanent of these were castra aestiva or aestivalia, "summer camps", in which the soldiers were housed sub pellibus or sub tentoriis, "under tents". Summer was the campaign season. For the winter the soldiers retired to castra hiberna containing barracks and other buildings of more solid materials, with timber construction gradually being replaced by stone. The camp allowed the Romans to keep a rested and supplied army in the field. Neither the Celtic nor Germanic armies had this capability: they found it necessary to disperse after only a few days. The largest castra were legionary fortresses built as bases for one or more whole legions. From the time of Augustus more permanent castra with wooden or stone buildings and walls were introduced as the distant and hard-won boundaries of the expanding empire required permanent garrisons to control local and external threats from war-like tribes. Previously, legions were raised for specific military campaigns and subsequently disbanded, requiring only temporary castra. From then on many castra of various sizes were established many of which became permanent settlements. 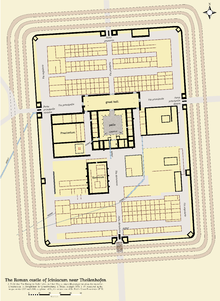 Plan of a typical Roman fort. From the most ancient times Roman camps were constructed according to a certain ideal pattern, formally described in two main sources, the De Munitionibus Castrorum and the works of Polybius. P. Fl. Vegetius Renatus has a small section on entrenched camps as well. The terminology varies but the basic plan is the same. The hypothesis of an Etruscan origin is a viable alternative. 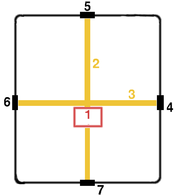 The ideal enforced a linear plan for a camp or fort: a square for camps to contain one legion or smaller unit, a rectangle for two legions, each legion being placed back-to-back with headquarters next to each other. Laying it out was a geometric exercise conducted by experienced officers called metatores, who used graduated measuring rods called decempedae ("10-footers") and gromatici who used a groma, a sighting device consisting of a vertical staff with horizontal cross pieces and vertical plumb-lines. Ideally the process started in the centre of the planned camp at the site of the headquarters tent or building (principia). Streets and other features were marked with coloured pennants or rods. The street plans of various present-day cities still retain traces of a Roman camp, for example Marsala in Sicily, the ancient Lilybaeum, where the name of the main street, the Cassaro, perpetuates the name "castrum". The Castrum's special structure also defended from attacks. 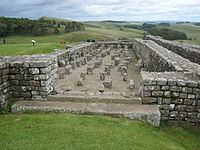 The base (munimentum, "fortification") was placed entirely within the vallum ("wall"), which could be constructed under the protection of the legion in battle formation if necessary. The vallum was quadrangular aligned on the cardinal points of the compass. The construction crews dug a trench (fossa), throwing the excavated material inward, to be formed into the rampart (agger). On top of this a palisade of stakes (sudes or valli) was erected. The soldiers had to carry these stakes on the march. Over the course of time, the palisade might be replaced by a fine brick or stone wall, and the ditch serve also as a moat. A legion-sized camp always placed towers at intervals along the wall with positions between for the division artillery. Around the inside periphery of the vallum was a clear space, the intervallum, which served to catch enemy missiles, as an access route to the vallum and as a storage space for cattle (capita) and plunder (praeda). Legionaries were quartered in a peripheral zone inside the intervallum, which they could rapidly cross to take up position on the vallum. Inside of the legionary quarters was a peripheral road, the Via Sagularis, probably a type of "service road", as the sagum, a kind of cloak, was the garment of soldiers. Reconstructed east gate of a Castrum Stativum, a more permanent base, at Welzheim, Germany. Porta called Savoia, Susa, Piedmont, 275-290 BC. On one side of the praetorium was the quaestorium, the building of the quaestor (supply officer). On the other side was the forum, a small duplicate of an urban forum, where public business could be conducted. Along the Via Principalis were the homes or tents of the several tribunes in front of the barracks of the units they commanded. The Via Principalis went through the vallum in the Porta Principalis Dextra ("right principal gate") and Porta Principalis Sinistra ("left, etc. "), which were gates fortified with turres ("towers"). Which was on the north and which on the south depends on whether the praetorium faced east or west, which remains unknown. On the other side of the praetorium the Via Praetoria continued to the wall, where it went through the Porta Decumana. In theory this was the back gate. Supplies were supposed to come in through it and so it was also called, descriptively, the Porta Quaestoria. The term Decumana, "of the 10th", came from the arranging of manipuli or turmae from the first to the 10th, such that the 10th was near the intervallum on that side. The Via Praetoria on that side might take the name Via Decumana or the entire Via Praetoria be replaced with Decumanus Maximus. In peaceful times the camp set up a marketplace with the natives in the area. They were allowed into the camp as far as the units numbered 5 (half-way to the praetorium). There another street crossed the camp at right angles to the Via Decumana, called the Via Quintana, "5th street". If the camp needed more gates, one or two of the Porta Quintana were built, presumably named dextra and sinistra. If the gates were not built, the Porta Decumana also became the Porta Quintana. At "5th street" a public market was allowed. Model of the legionary fortress of Deva (Chester) plus adjoining amphitheatre in Britannia (reconstruction). Not much remains of these horrea (granaries) at Arbeia, but the longitudinal supports for the floor can be seen. The Via Quintana and the Via Principalis divided the camp into three districts: the Latera Praetorii, the Praetentura and the Retentura. In the latera ("sides") were the Arae (sacrificial altars), the Auguratorium (for auspices), the Tribunal, where courts martial and arbitrations were conducted (it had a raised platform), the guardhouse, the quarters of various kinds of staff and the storehouses for grain (horrea) or meat (carnarea). Sometimes the horrea were located near the barracks and the meat was stored on the hoof. Analysis of sewage from latrines indicates the legionary diet was mainly grain. Also located in the Latera was the Armamentarium, a long shed containing any heavy weapons and artillery not on the wall. A sanitary channel at Potaissa, Dacia (modern Romania). It is placed cross-slope with a slight decline and then exits down-slope. Further from the Quaestorium were the tents of the Nationes ("natives"), who were auxiliaries of foreign troops, and the legionaries themselves in double rows of tents or barracks (Strigae). One Striga was as long as required and 18 m wide. In it were two Hemistrigia of facing tents centered in its 9 m strip. Arms could be stacked before the tents and baggage carts kept there as well. Space on the other side of the tent was for passage. In the northern places like Britain, where it got cold in the winter, they would make wood or stone barracks. The Romans would also put a fireplace in the barracks. They had about three bunk beds in it. They had a small room beside it where they put their armour; it was as big as the tents. They would also make these barracks if the fort they had was going to stay there for good. A tent was 3 by 3.5 metres (0.6 m for the aisle), ten men per tent. Ideally a company took 10 tents, arranged in a line of 10 companies, with the 10th near the Porta Decumana. Of the c. 9.2 square metres of bunk space each man received 0.9, or about 0.6 by 1.5 m, which was only practical if they slept with heads to the aisle. The single tent with its men was called contubernium, also used for "squad". A squad during some periods was 8 men or fewer. The Centurion, or company commander, had a double-sized tent for his quarters, which served also as official company area. Other than there, the men had to find other places to be. To avoid mutiny, it became extremely important for the officers to keep them busy. For sanitary facilities, a camp had both public and private latrines. A public latrine consisted of a bank of seats situated over a channel of running water. One of the major considerations for selecting the site of a camp was the presence of running water, which the engineers diverted into the sanitary channels. Drinking water came from wells; however, the larger and more permanent bases featured the aqueduct, a structure running a stream captured from high ground (sometimes miles away) into the camp. The praetorium had its own latrine, and probably the quarters of the high-ranking officers. In or near the intervallum, where they could easily be accessed, were the latrines of the soldiers. A public bathhouse for the soldiers, also containing a latrine, was located near or on the Via Principalis. Reconstructed barracks of a Castra Hiberna, or "winter camp", at Arbeia (South Shields). Each doorway provides entry to a large room, the sleeping quarters of one contubernium, or "squad" of about 10 men. If, for example, the camp was built on an outcrop, it followed the lines of the outcrop. The terrain for which it was best suited and for which it was probably designed in distant prehistoric times was the rolling plain. The camp was best placed on the summit and along the side of a low hill, with spring water running in rivulets through the camp (aquatio) and pastureland to provide grazing (pabulatio) for the animals. In case of attack, arrows, javelins and sling missiles could be fired down at an enemy tiring himself to come up. For defence troops could be formed in an acies, or "battle-line", outside the gates, where they could be easily resupplied and replenished, as well as being supported by archery from the palisade. The streets, gates and buildings present depended on the requirements and resources of the camp. The gates might vary from two to six and not be centred on the sides. Not all the streets and buildings might be present. Many of the towns of England still retain forms of the word castra in their names, usually as the suffixes "-caster", "-cester" or "-chester" – Lancaster, Tadcaster, Worcester, Gloucester, Mancetter, Uttoxeter, Colchester, Chester, Manchester and Ribchester for example. Castle has the same derivation, from the diminutive castellum or "little fort", but does not usually indicate a former Roman camp. 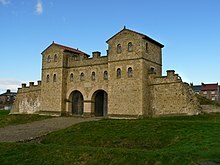 Whitley Castle however is an exception, referring to the Roman fort of Epiacum in Northumberland. Activities conducted in a castra can be divided into ordinary and "the duty" or "the watch". Ordinary activity was performed during regular working hours. The duty was associated with operating the installation as a military facility. For example, none of the soldiers were required to man the walls all the time, but round-the clock duty always required a portion of the soldiers to be on duty at any time. Duty time was divided into vigilia, the eight watches into which the 24-hour day was divided so they stood guard for 3 hours that day. The Romans used signals on brass instruments to mark time. These were mainly the buccina or bucina, the cornu and the tuba. As they did not possess valves for regulating the pitch, the range of these instruments was somewhat limited. Nevertheless, the musicians (Aenatores, "brassmen") managed to define enough signals for issuing commands. The instrument used to mark the passage of a watch was the buccina, from which the trumpet derives. It was sounded by a buccinator. The pillars supported a raised floor to keep food dry and free from vermin in this granary at Housesteads Roman Fort (Vercovicium) on Hadrian's Wall. Ordinary camp life began with a buccina call at daybreak, the first watch of the day. The soldiers arose at this time and shortly after collected in the company area for breakfast and assembly. The centurions were up before them and off to the principia where they and the equites were required to assemble. The regimental commanders, the tribunes, were already converging on the praetorium. There the general staff was busily at work planning the day. At a staff meeting the Tribunes received the password and the orders of the day. They brought those back to the centuriones, who returned to their company areas to instruct the men. For soldiers, the main item of the agenda was a vigorous training session lasting about a watch long. Recruits received two, one in the morning and one in the afternoon. Planning and supervision of training were under a general staff officer, who might manage training at several camps. According to Vegetius, the men might take a 32 kilometres (20 mi) hike or a 6–8 kilometres (3.7–5.0 mi) jog under full pack, or swim a river. Marching drill was always in order. Each soldier was taught the use of every weapon and also was taught to ride. Seamanship was taught at naval bases. Soldiers were generalists in the military and construction arts. They practiced archery, spear-throwing and above all swordsmanship against posts (pali) fixed in the ground. Training was taken very seriously and was democratic. Ordinary soldiers would see all the officers training with them including the praetor, or the Emperor, if he was in camp. Swordsmanship lessons and use of the shooting range probably took place on the campus, a "field" outside the castra, from which English camp derives. Its surface could be lightly paved. Winter curtailed outdoor training. The general might in that case have sheds constructed, which served as field houses for training. There is archaeological evidence in one case of an indoor equestrian ring. Officers were allowed to marry and to reside with their families on base. The army did not extend the same privileges to the men, who were not allowed to marry. However, they often kept common law families off base in communities nearby. The communities might be native, as the tribesmen tended to build around a permanent base for purposes of trade, but also the base sponsored villages (vici) of dependents and businessmen. Dependants were not allowed to follow an army on the march into hostile territory. Military service was for about 25 years. At the end of that time, the veteran was given a certificate of honorable discharge (honesta missio). Some of these have survived engraved on stone. Typically they certify that the veteran, his wife (one per veteran) and children or his sweetheart were now Roman citizens, which is a good indication that troops, which were used chiefly on the frontier, were from peoples elsewhere on the frontier who wished to earn Roman citizenship. However, under Antoninus Pius, citizenship was no longer granted to the children of rank-and-file veterans, the privilege becoming restricted only to officers. Veterans often went into business in the communities near a base. They became permanent members of the community and would stay on after the troops were withdrawn, as in the notable case of Saint Patrick's family. The remains of a granary at Housesteads Roman Fort on Hadrian's Wall. ^ A 2nd declension neuter noun. According to Lewis & Short, dictionary item linked in External links, General, either the singular or plural was used, castra with a possible meaning of tents. ^ See Vegetius, Epitoma rei militaris, 3.8. In Clark's translation, 3.8 is "Rules for Encamping an Army," last paragraph. "Small fort" is castellum, which Vegetius explains is the diminutive of castra. He conceives of them as fortified outposts to be manned by cavalry protecting a supply route; i.e., a base from which to conduct patrols. ^ Campbell 2009, p. 4. Included is a discussion about the typologies of Roman fortifications. ^ Pokorny, Julius (1959). Indogermanisches Etymologisches Wörterbuch (in German). 2. Bern: Francke. p. 586. ^ Nepos, Cornelius. "Alcibiades 9.3". Latin Library. ^ Lewis & Short under External links, General, as well as many uncited Latin dictionaries, make this suggestion. ^ Campbell, Duncan B. (2009). "A Camp in search of a Campaign: The reality of Hyginus' Roman army". Ancient Warfare. 3 (3): 46–49. Retrieved 18 April 2019. ^ Flavius Josephus: The Jewish War. III.5.1, trans. William Whiston. ^ See Rebecca H. Jones 2012 Roman camps in Britain, Amberley Press, Stroud. ^ see W.S. Hanson 2009 Building the forts and frontiers, in W.S. Hanson (ed) The army and frontiers of Rome. Papers offered to David Breeze on the occasion of his sixty-fifth birthday and his retirement from Historic Scotland, JRA Supplementary Series 74, Portsmouth, Rhode Island, 33-43. ^ Roman Legionary Fortresses 27BC-378AD, D.B.Campbell, Osprey. ^ See Hanson and Friel (1995) under External links, Forts and fortifications, below. ^ Book VI Section 19 The Roman Military System pages 313-368 in Thayer's Loeb's Polybius under Primary sources below..
^ An extensive lexicon at the Romans in Britain site, linked under External links, General, below, matches military terms of all periods of ancient Rome to English equivalents. ^ Bell (2001) linked in External links, General, favors the view that the Greeks either influenced the Romans directly in the choice of the quadrangular plan or influenced the Etruscans, who influenced the Romans. The Greek theory certainly does not exclude an Indo-European origin. ^ Smith (1875) under External links, Forts and fortifications. The sudes were not just simple stakes. Three or four branches were left on for interlocking. ^ Cardo is the hinge line of a door and therefore is any main axis. In surveying it was the line drawn across (at 90° using a groma) the east-west decumanus, which was the first line drawn based on the position of the sun at sunrise. The via principalis would certainly be a cardo. ^ Decumana (feminine of decumanus) derives most likely from decima manus, "tenth part" or "tenfold". As tenfold, it meant "immense." As tenth part, it also meant "across", such as a cross-path or cross-boundary. In surveying it was the first line drawn, after noting the position of the sun at sunrise in order to know exactly where east was; the cardo was then drawn across it at right angles. This was necessary, because the ancient Romans did not have the compass to determine the position of the magnetic north. The connection between tenth and across remains obscure. The presence of numbered streets makes it less likely that the via decumana was "cross street" than that it was "10th street." ^ The term legatus had other meanings in other contexts, such as governor or ambassador. ^ Sims, Lesley: "Roman Soldier's Handbook", page 55-56. Usborne Publishing Ltd, 2004. ^ Spain was especially heavily colonized by veterans, who Romanized the language and the architecture. Refer to Miranda (2002) under External links, Camp life, below. ^ Roby under Secondary sources below. ^ a b Vegetius Book I, linked in Primary sources below. ^ Verboven, pages 15-17, under External links, Camp life. The author states estimates of coinage passing hands at various locations. A soldier received pay less deductions for expenses. He could borrow from or invest with the first bankers, the argentarii or negotiatores nummularii, whose business was to supply the legion with money for a percentage. ^ A link to the Vindolanda tablets database with introductions, descriptions and bibliography is given under Primary sources below. ^ See The Tombstone of Anicius Ingenuus, a medicus ordinarius, under Primary sources below. ^ Scheidel page 14 under External links, Camp life. ^ Scheidel pages 2-8 under External links, Camp life. ^ Verboven describes the process. A veteran with a certain skill continued it as a contractor for the army. For example, a gladiarius or maker of swords, became a negotiator gladiarius, a supplier of swords. There were a large number of such names: the negotiatores vestiarii for clothing, frumentarii for grain, salsari leguminari for the salted vegetable concession, and so on. Josephus. The War of the Jews . Translated by William Whiston – via Wikisource. Population of Vindolanda (100 AD). "(the Tablets)" (shtml). Vindolanda Tablets Online: The Roman Army: Activities. Centre for the Study of Ancient Documents, Academic Computing Development Team at Oxford University. Polybius. "The Histories (English translation) Book VI". The Loeb Classical Library, Volume III Section VI. Web publication on Bill Thayer's Polybius site. Roman government (160 AD). "(Military Diploma)". Military Diploma of Discharge and Roman Citizenship. Metz, George W. Legion xxiv website. Unknown inscriber (3rd century AD). "(the Tombstone)". Tombstone of Anicius Ingenuus, Museum of Antiquities Website. Newcastle University. Archived from the original on 2006-08-25. Vegetius. "Flavius Vegetius Renatus Epitoma Rei Militaris Book I". Armamentarium. Archived from the original on 2006-06-18. Selections, Latin and English juxtaposed by paragraph. Translator unknown. Publius Flavius Vegetius Renatus (2001). "The Military Institutions of the Romans (De Re Militari)". Digital Attic 2.0. Clarke, Lieutenant John (translator); unknown editor. Brevik, Mads. Books I-III only. The unknown editor altered the translation "to conform to modern usage" and abbreviated the text. Access is by subtitle. Search only within subsection. Bishop, M.C. (2012). Handbook to Roman Legionary Fortresses. Barnsley: Pen and Sword. ISBN 978-1-84884-138-3. Johnson, Anne (1983). Roman Forts of the 1st and 2nd centuries AD in Britain and the German Provinces,. London: Adam & Charles Black. ISBN 0-7136-2223-7. Keppie, Lawrence (1994). The Making of the Roman Army from Republic to Empire. New York: Barnes and Noble Books. ISBN 1-56619-359-1. Roby, Henry John (1872). A Grammar of the Latin Language from Plautus to Suetonius: Second Edition. London: Macmillan. p. 453. Wikimedia Commons has media related to Castra. Below are a number of links to sites reporting or summarizing current research or thinking. Many are reprints of articles made available to the public at no charge. The historical researcher will find their bibliographies of great interest. "Fortress Study Group". Study Group devoted to the knowledge of Forts and Fortifications of all times and Greek and Roman ones: with a Journal Fort and a newsletter Casemate. Fortress Study Group. "Army Picture Index". Illustrated History of the Roman Empire. roman-empire.net. Archived from the original on 2010-06-12. Retrieved 2006-06-04. Bell, Anders (2001). "Castra et urbs romana: An Examination of the Common Features of Roman Settlements in Italy and the Empire and a System to aid in the Discovery of their Origins". CAC Undergraduate Essay Contest for 2000-2001. Classical Association of Canada. Lewis, Charlton T.; Short, Charles. "Castrum/Castra". A Latin Dictionary. The Perseus Digital Library. Ramsay, William (1875). "Castra". William Smith A Dictionary of Greek and Roman Antiquities. John Murray, republished on Bill Thayer's LacusCurtius site. "The Roman Military in Britain". roman-britain.org. Archived from the original on 2010-06-13. Retrieved 2006-06-11. Links to a Glossary. 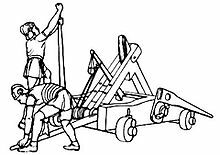 The Romans in Britain, Glossary of Military terms. Note that both Latin and Greek terms with the same meaning are included. "Antonine Wall Fort: Bearsden, New Kilpatrick, Strathclyde". roman-britain.org. Archived from the original on 2010-06-10. Retrieved 2006-06-03. Hanson, W.S. ; Friel, J.G.P. (1995). "Westerton: A Roman Watchtower on the Gask Frontier" (PDF). Proceedings of the Society of Antiquaries of Scotland. 125: 499–519. "Iron-Age Hillfort, Roman Stores Depot Brandon Camp, Leintwardine Herefordshire". roman-britain.org. Archived from the original on 2006-09-27. Retrieved 2006-06-03. Lendering, Jona. "Haltern". Livius articles on ancient history. livius.org. "Nidum: Roman Auxiliary Fort: Neath, West Glamorgan". roman-britain.org. Archived from the original on 2006-05-27. Retrieved 2006-06-03. "Pinnata Castra: Roman Legionary Fortress & Marching Camps: Inchtuthill, Tayside". roman-britain.org. "Roman Fortress". Time trail. Exeter City Council. Archived from the original on 2006-06-12. Smith, William (1875). "Vallum". A Dictionary of Greek and Roman Antiquities. London: John Murray. p. 1183. . Article republished on Bill Thayer's LacusCurtius site, which has the advantage of linking to ancient texts cited by Smith. Tribus. "The Roman Camp in Bonn". Eduvinet Services. "The Roman Camp Sostra". bulgariancastles.com. Archived from the original on 2008-07-24. Campbell, Duncan B. (2010). "Women in Roman forts: Residents, visitors or barred from entry?". Ancient Warfare. IV (6): 48–53. Miranda, Frank (2002). "Castra et Coloniae: The Role of the Roman Army in the Romanization and Urbanization of Spain" (PDF). Quaestio: The UCLA Undergraduate History Journal. Phi Alpha Theta: History Honors Society, UCLA Theta Upsilon Chapter, UCLA Department of History. Archived from the original (pdf) on 2006-09-13. Scheidel, Walter (November 2005). "Marriage, Families and Survival in the Roman Imperial Army: Demographic Aspects" (pdf). Princeton/Stanford Working Papers in Classics. Princeton University. Verboven, Koenraad (2007). "Good for Business. The Roman Army and the Emergence of a 'Business Class' in the Northwestern Provinces of the Roman Empire (1st century BCE - 3rd century CE)" (PDF). In Lukas, De Blois; Elio, Lo Cascio (eds.). The Impact of the Roman Army (200 BC - AD 476). Economic, Social, Political, Religious and Cultural Aspects. Leiden & Boston: Brill. pp. 295–314. ISBN 90-04-16044-2.